Save up to 50% on your graduation fee with Concordia College's 20th Anniversary Offer. 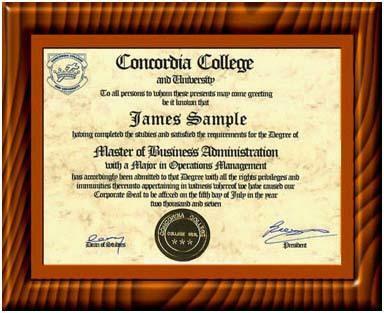 Unlimited basic degree verification welcome by fax or e-mail. Have your inquirers include their own email address for us to reply. 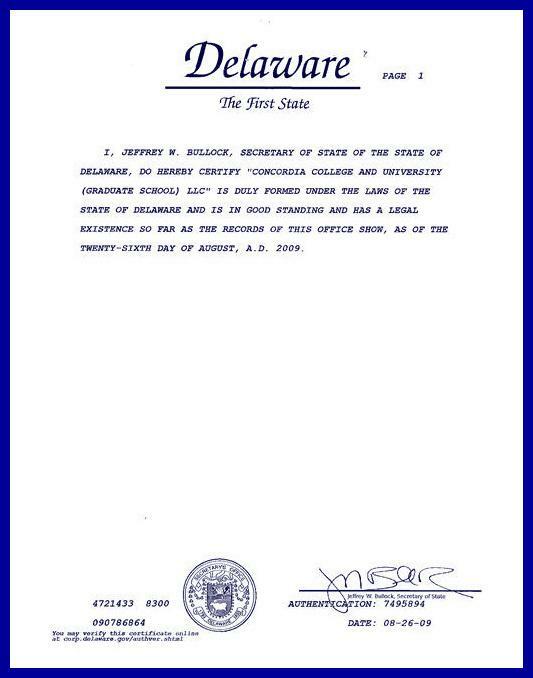 * Self-verification attempts, attempts to verify degrees not conferred by Concordia College & University® of Delaware, and attempts to merely 'test' our system will not be acted upon. Delivered in a stylish display book within 8 to 10 business days worldwide. Free shipping included. No extra costs, no hidden charges. None of your Concordia College credentials mention how your graduation requirements were met. There is no mention of ''distance learning'', ''prior learning assessment'',''fast-track'' or any such term. 1. Minors and/or dual majors are not awarded, unless otherwise mentioned in your admission record. Should your enrollment contain any mention of minors/dual majors, Concordia College will only consider your first major. 2. If your preferred major is not listed, you can submit your resume for our free assessment anyway. IF we find a qualified assessor available to review your request, your resume will be evaluated and you will obtain the results of your assessment by return e-mail. 3. If your enrollment form contains an academically invalid combination of degree titles and majors (e.g. 'Bachelor of Theology with a major in Fire Science', 'Bachelor of Fine Arts with a major in Electrical Engineering' ) or an unavailable major, Concordia College will adjust this portion of your enrollment form and issue a correct and available degree instead, without prior notice.